Have you heard that there is a Battleship movie that is coming out on May 18th? The movie is by Universal Pictures and stars Taylor Kitsch, Alexander Skarsgard, Brooklyn Decker, Liam Neeson and recording superstar, Rihanna! 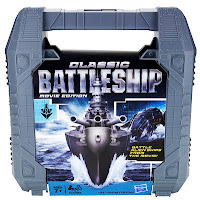 To celebrate the movie, Hasbro has a new Classic Battleship Movie Edition game. In both the movie and the new game, the human Navy battle the Alien fleet for victory. The Battleship game has approved a lot since I was a child and originally played it. This version is highly portable. It easily separates into the two sides: Human Navy and Alien Fleet. 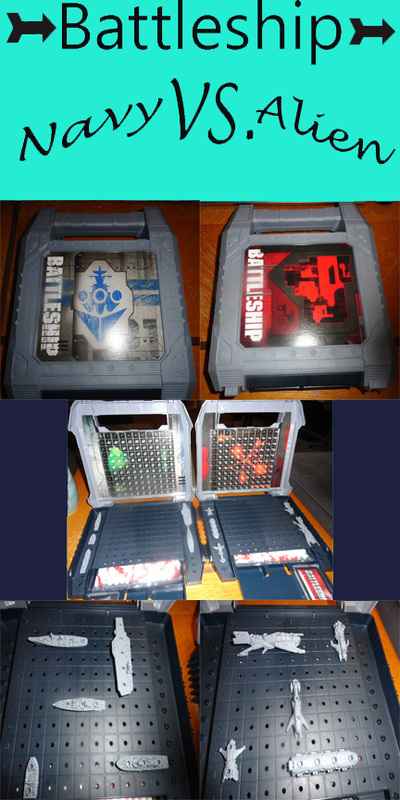 Each side of the game is customized to match down to the ships. The sides separate so that you can play with someone who is across the room. Each half has a sliding drawer to hold all the colored pegs and cards. Yes, there are cards with this version! 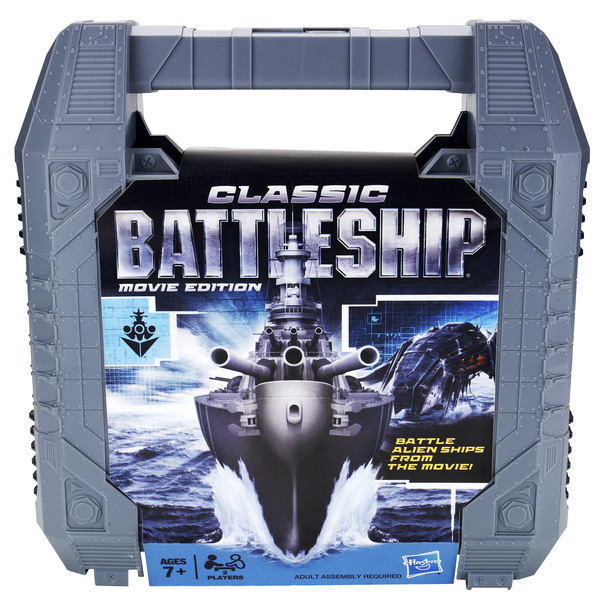 Classic Battleship Movie Edition requires 2 players and is recommended for ages 7+. 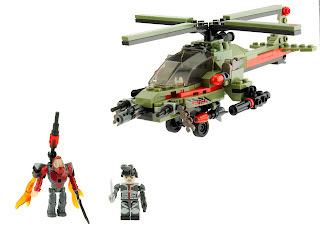 This 174-piece set includes a Combat Chopper, Fighter Pilot KREON figure, and Alien Scout KREON figure. This set does require some assembly. It was packaged in plastic bags and came with simple instructions on how to put it together. My Husband was all to happy to "build" this set. It only took him a few minutes to do. 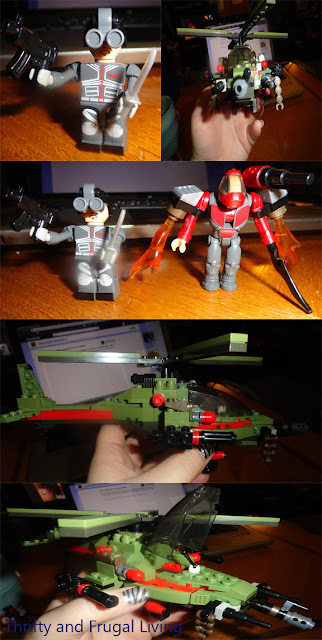 The characters would be great for a child to build since they only have a few pieces and are easy to make. The helicopter will require and older child or adult. If an adult makes it for a child, you may want to glue it as you assemble. Once everything is assembled it is a fun set. The chopper cockpit lifts up, you can spin the rotor and even file missiles at the incoming aliens. This set is recommended for ages 7-14 (although Hubby is proof that older males may enjoy it as well). These are both fantastic products that I highly recommend. To keep up with Hasbro news and new games, like their Family Game Night page on Facebook. 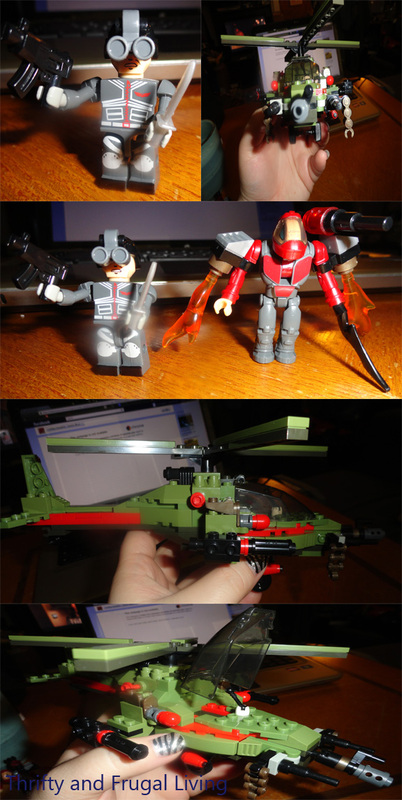 One Thrifty and Frugal Living reader will win both the Classic Battleship Movie Edition Game and the KRE-O Battleship Combat Chopper Set. Disclaimer: I received the mentioned product(s) in exchange for this review. I was not compensated in any other way. All opinions are 100% my own thoughts.